Scratch beneath the surface of today's culture and you'll find we're not so different from ancient Israel. True, our sophistication, mobility, and technology eclipse anything the Israelites could have imagined. Our worship is far different, to say nothing of our language and customs. Yet if the prophets Hosea, Amos, and Micah were to visit us today, we might be shocked to see how little their messages would differ from the ones they delivered 2,800 years ago. ;For human hearts are still the same--and so is God. Injustice, oppression, and political corruption anger him as much as ever. Apostasy still grieves him. His judgment of sin remains as fierce as his love is strong. And the hope God extends to those who turn toward him is as brilliant now as at any time in history. ;Revealing the links between Israel eight centuries B.C. and our own times, Gary V. Smith shows how the prophetic writings of Hosea, Amos, and Micah speak to us today with relevance and conviction. Hosea, Amos, Micah : NIV Application Commentary by Gary V. Smith was published by Zondervan Academic in February 2001 and is our 16817th best seller. 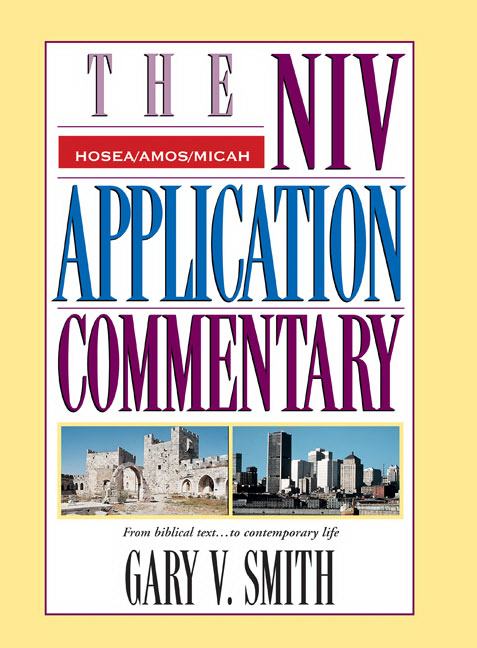 The ISBN for Hosea, Amos, Micah : NIV Application Commentary is 9780310206149. Be the first to review Hosea, Amos, Micah : NIV Application Commentary! Got a question? No problem! Just click here to ask us about Hosea, Amos, Micah : NIV Application Commentary.